This wedding video Villa Erba shows a magical backdrop for a luxurious wedding on Lake Como. As the perfect setting for a romantic outdoor ceremony. A water front wedding with soft sunshine, pretty blooms, and sophisticated details. Is exactly how Vivien and Jojo celebrated their love with close friends and family. It’s always an honor to be on Lake Como as wedding videographers. Making such a beautiful moment as this wedding last forever. There are many things involved in a destination wedding in order for it to be perfect. The venue, providers, great professionals. It’s amazing to work with talented people that puts their heart in what they do. That’s how we feel when we work at Villa Erba on Lake Como. The place where this wedding video took place. Making a wedding video Villa Erba is even more inspiring due to the fact that the great director Luchino Visconti, spent many of his summers there and the rooms of the villa inspired the sets of some of his most famous masterpieces. One of the things most impressive in Villa Erba are the ancient frescoes. The precious inlaid ceilings and Mannerist rooms. Besides the beautiful blossomy gardens. This wedding video had such a fun mood. The boat ride which was obviously captured with our drone. The sprightly party and the toast. Everything worked in a perfect harmony. From the most formal conventions to the wildest party. Where music until late at night was guaranteed. 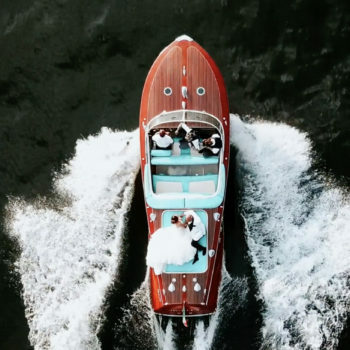 This was such an unique wedding videography on Lake Como. If anyone ever plans to make a destination wedding in Italy. 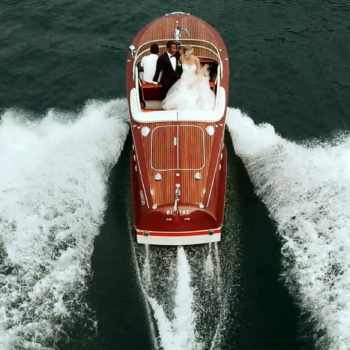 As wedding videographers we couldn’t recommend a nothing less than dreamy wedding on Lake Como.